Soft Gloss 40lb. is a subtle glossy laser paper for creating your own in-house brochures and newsletters with results comparable to a professional print service. NEW! This is a new upgraded paper, now even brighter (replacing item #255). Your documents will stand out far above prints on uncoated papers. Applications includebrochures, newsletters and documents which do not require a photo-gloss appearance, but must make a professional impression above and beyond standard bright whitelaser paper. NOTE: A slightly glossier version of this product is available. For details, see Laser Gloss, which is particularly appropriate for brochures and advertising when a professional magazine-like appearance is desired. The soft gloss coating is proven to be effective and reliable when used in both laser and color laser printers. The coating will not melt in your professional-grade color laser printer. Soft gloss is also available in a one-sided, heavier 58 lb. 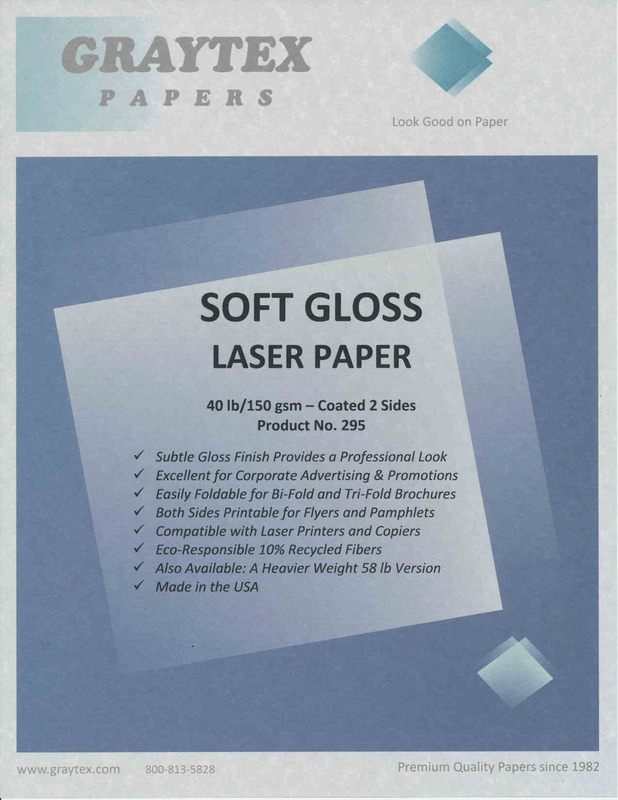 soft gloss paper for use as covers and single-sided presentation documents. For a truly glossier sheen (similar to the appearance of magazine pages) see 32 lb. Laser Gloss. Also available is a heavier 58 lb. Laser Gloss.